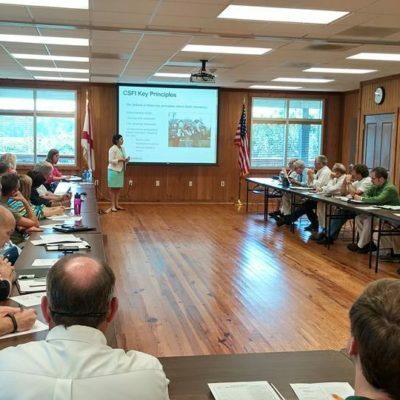 On July 17th, 2015, Coastal Alabama Partnership (CAP) and the Coalition for Sustainable Flood Insurance (CSFI) facilitated a roundtable discussion around the 2017 reauthorization of the National Flood Insurance Program (NFIP). CSFI is working to develop a practical, affordable program of flood insurance and establish public support for that protection. Caitlin Berni of the Greater New Orleans Inc. Regional Economic Development, met with municipal, county and state officials, insurance agents and others from Mobile and Baldwin counties to discuss flood insurance problems faced by coastal residents on the Gulf Coast and in other areas of the United States. Ms. Berni began the meeting by giving a background on CSFI. The coalition was formed in May 2013 by elected and business leaders in response to drastic flood insurance premium hikes as a result of the Biggert-Waters Flood Insurance Reform Act of 2012, inaccurate and incomplete FEMA flood maps, and questionable actuarial calculations. CSFI, CAP and the Mobile Area Chamber of Commerce were critical in passing the Homeowner Flood Insurance Affordability Act in March, 2014 which rolled back many harmful rates that would have been enforced under the Biggert-Waters Act. CSFI currently consists of 35 states and over 250 organizations across the nation. Protect home and business owners who have “played by the rules” – i.e. built to code, maintained insurance and have not had repetitive loses. Rate Structure Changes – Proposed changes include 1) preserving grandfathering and the basement exception for non-negotiables, 2) support of Section 205 properties (built prior to flood mapping) and 3) enforcing an affordability cap that prohibits policies from exceeding 1% of the policy value on the property. Mapping Process Reforms – Proposed changes include 1) Including exclusion provisions codified so that parishes and counties can adopt portions of flood maps at a time, 2) requiring any major changes to the mapping process receive input from state and local jurisdictions and 3) requiring Levee Analysis and Mapping Procedure provisions requested by parishes in the pilot program to be included. FEMA Administration Reforms – Proposed changes include 1) limiting Write Your Own commissions to 30% of the first $1,000 of the annual premium and 5% of the premium above $1,000, 2) strengthening enforcement of requirements to carry flood insurance in Special Flood Hazard Areas and 3) including long term funding for the Flood Insurance Advocate Office. Those in attendance provided helpful feedback on these three focus areas and recommended additional provisions. Suggestions of additional provisions included greater education of surveyors and flood insurers about the NFIP, simplification of the overall rating structure, and streamlining of the process to lower administrative costs. Feedback from this meeting and similar events being held in Tampa, Charleston and Boston will be used to inform a whitepaper to be presented to Congress this fall regarding the flood insurance issue. For more information on CSFI’s effort, please visit CSFI.info or contact Caitlin Berni at cberni@gnoinc.org. If you are interested in following this process locally, please contact CAP at contact@72.249.150.161 and look for updates in future CAP newsletters. You can also click here to sign up for our monthly e-newsletter.